Also serving communities of Bingham Farms. There are 17 Memory Care Facilities in the Southfield area, with 2 in Southfield and 15 nearby. The average cost of memory care in Southfield is $1,800 per month. This is lower than the national median of $4,650. To help you with your search, browse the 41 reviews below for memory care facilities in Southfield. Better rated regions include Royal Oak with an average rating of 5.0 out of 5 stars. Caring.com has helped thousands of families find high-quality senior care. To speak with one of our Family Advisors about memory care options and costs in Southfield, call (855) 863-8283. There are 240,000 people in Michigan living with Alzheimer's disease or another form of dementia. As the largest risk factor in the condition is growing older, it impacts areas with older populations like Southfield, where 19 percent of the city's 73,000 people are aged over 65. There are over a dozen memory care facilities in Southfield and nearby communities to help cater to people with dementia. In Michigan, memory care is offered by both adult foster care (ACF) facilities and homes for the aged (HFA). There are no specific staffing or training requirements for facilities that offer specialized Alzheimer's care, but they do need to provide residents or their advocates with details of the care provided, including staff training and building design. The Southfield area is home to world-class medical facilities, including those specializing in brain health and dementia care such as Henry Ford Hospital, in the event of medical emergencies or illness. Southfield is a suburb of Detroit, a city that had one of the top 20 highest year-round particle pollution rates in the State of the Air 2018 report. Despite this, Oakland County received passing grades for both annual and short-term particle pollution. Ozone pollution received a failing grade, which may impact the health of seniors with respiratory conditions. Southfield has cold winters, with January lows dipping into the teens and around 36 inches of snow each year, 10 inches more than the national average. Families may wish to ask facilities they tour about plans that protect residents during extreme weather. The cost of living in Southfield is rated at 107 on the Sperling index, 7 points higher than the national average of 100. However, many daily items are still affordable. Healthcare, in particular, is rated at 83 on the index, 17 points lower than the national average. Families of seniors with health conditions may find that this allows them to put more money towards their memory care budget. Memory Care costs in Southfield start around $1,800 per month on average, while the nationwide average cost of memory care is $4,800 per month. It’s important to note that memory care rates in Southfield and the surrounding suburbs can vary widely based on factors such as location, the level of care needed, apartment size and the types of amenities offered at each community. 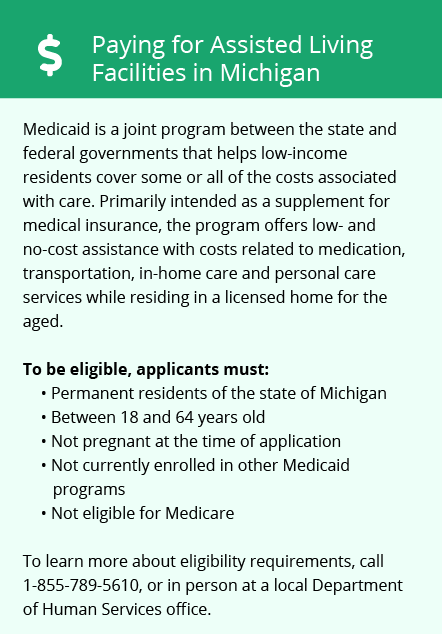 Learn more about these programs, plus who’s eligible, on our Memory Care in Michigan page. For more information about different ways to finance memory care, visit our Memory Care in Michigan page. Southfield and the surrounding area are home to numerous government agencies and non-profit organizations offering help for seniors searching for or currently residing in an assisted living community. These organizations can also provide assistance in a number of other eldercare services such as geriatric care management, elder law advice, estate planning, finding home care and health and wellness programs. To see a list of free memory care resources in Southfield, please visit our Assisted Living in Michigan page. 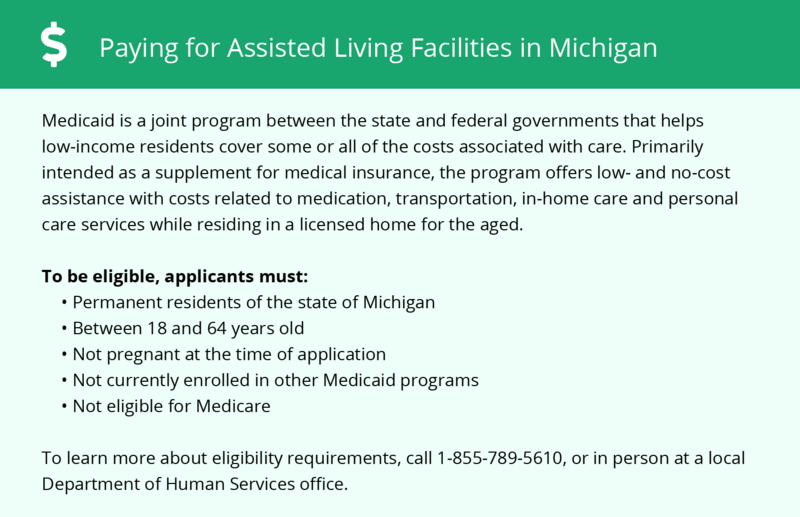 Southfield-area assisted living communities must adhere to the comprehensive set of state laws and regulations that all assisted living communities in Michigan are required to follow. Visit our Memory Care in Michigan page for more information about these laws.